The clothes dryer is a standard household fixture in most Western countries and locales with changing seasons. But in temperate climates, where most homes still hang their laundry out to dry, when does it make sense to invest in one more appliance, especially in cities like Singapore and Hong Kong where most live in flats that run on the small side? Sure, sunshine and warm breezes are free, but during monsoon seasons and with the unpredictability of tropical weather, what’s the premium for the extra time needed to re-wash clothes that get thoroughly soaked in downpours when no one is home to take the laundry in? Also, after a week in the office, nobody wants to take clothes in and iron them from scratch – dryers tend to smooth out many wrinkles in the process. The heat pump technology generation of clothes dryers heats air in a closed circuit system, passes it over clothes, then recycles the hot air to keep drying the laundry. The hot air leaving the drum is also cooled to condense moisture extracted from the clothes, which can be collected, filtered and reused for other purposes. End result: much less energy is needed to dry each load. 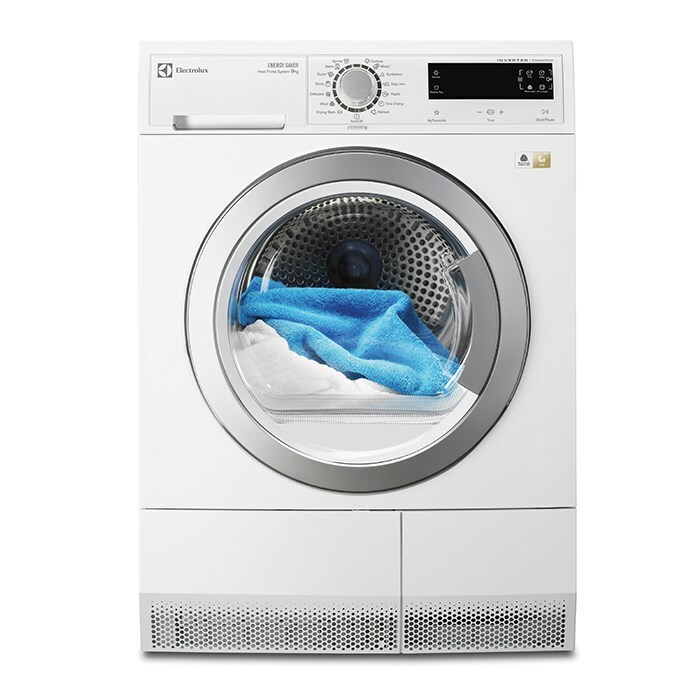 Which means your energy savings are up to 60% of conventional clothes dryers, without compromising performance. From savings on the time-space dimension to a low consumption of energy (which equates to lower utility bills), the Electrolux EDH3497RDW checks off all the reasons a clothes dryer fits right into our daily lives in Southeast Asia. Heat pump dryers may cost a bit more, but long-run savings in money, time and the environment is priceless.